I was heading back to my friend’s flat when I turned the corner. Two police officers were walking just in front of me. Walking towards all three of us was a large man with long hair and a four-foot sword. He was singing ‘U Can’t Touch This’ by MC Hammer at the top of his voice. He walks past us, and I catch up with the police officers. They look at me like I’m brain-dead. In fairness, it was plastic. Ladies and Gentlemen, I give you, the Edinburgh Fringe Festival. I wasn’t quick enough on the trigger to get a photo of the guy with the sword. 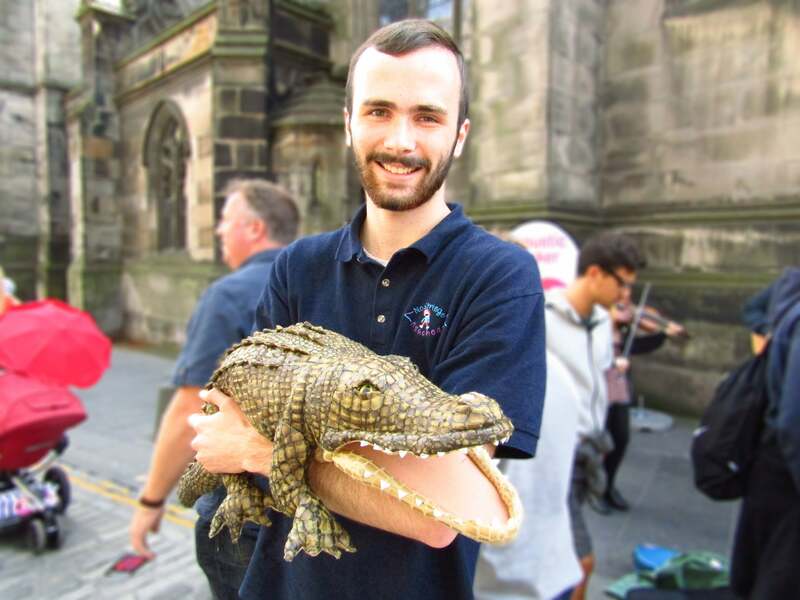 So here’s a guy with a crocodile instead. The Fringe was set up in 1947 by eight theatre groups who were denied the right to perform at the Edinburgh International Festival. Rather than giving up and going home, that said ‘screw it, we’re here, let’s make some theatre,’ and now it’s become the largest arts festival in the world. Every year, hundreds of thousands of people flock to Edinburgh in August to see shows that are wacky, wonderful, and sometimes down-right weird, but that doesn’t mean that it’s all been done before. Most of the companies involved in the Fringe are small, independent and just starting out, which means it always has this amazingly intimate feel – and we’re all about that at NITGB. Sure, it’s great to see some big name comedy acts, but it’s the diamonds in the rough that I find the most exciting. Of course, I’ll leave a few recommendations of my favourite shows at the bottom of the post, but even in August, that’s not all the city has to offer. Coffee shops, art galleries, stunning scenery, and where to grab a drink after a particularly traumatic theatrical experience – I’ve been looking for Edinburgh’s best kept secrets in its busiest month, and boy do I have some reccommendations. 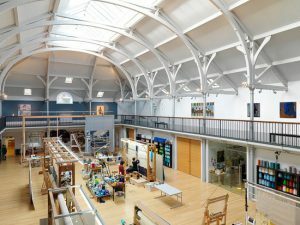 The Dovecote Gallery is one of Edinburgh’s best kept secrets. Nestled away on Infirmary Street, it’s just far enough off South Bridge to be missed by the thousands of passers-by, but for those who know where to look, it an absolute treat. Now THAT is a tapestry. 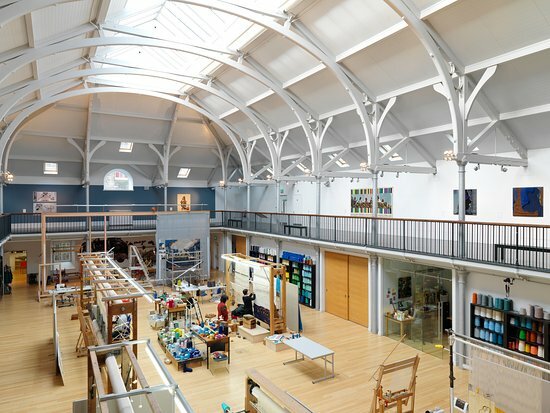 Set up in 1912 by th3 4th Marquess of Bute to make tapestries for his huge country house, it has moved around a fair bit, settling in its current home in 2008 and becoming a mainstay of contemporary art in Edinburgh. It is hosting a series of events for the Edinburgh Art Festival throughout August, including ‘Daughters of Persephone’, an exhibition which explores the role of women in contemporary art and sexism in weaving (sounds insane, is insane, is also incredibly well thought through and a beautiful exhibition). Dazzle Jewellery is back as well, exhibiting at the gallery for its sixth year running – once again, really worth checking out. But really, all this is preamble. The museum has had some financial difficulties since the turn of the millennium, but things are most certainly looking up, and now they employ five weavers on a full time basis. So once you’ve seen the two exhibitions at the front of the house, you should waste no time in heading through to the viewing balcony, where you can view Dovecot’s permeant collection, and watch the artists as they work. 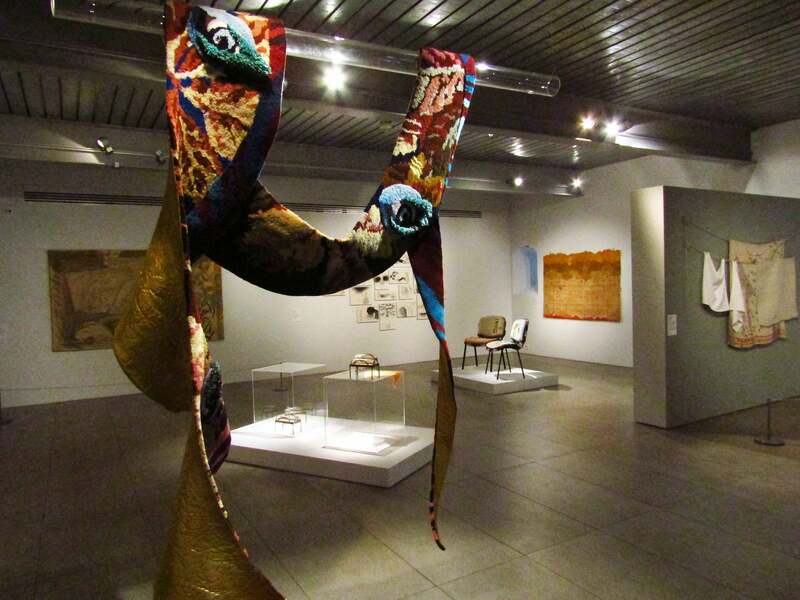 That’s what makes this museum so amazing – I think it can be easy to forget the person behind the painting (or in this case, the tapestry), but Dovecot really doesn’t let that happen. Personally, I would recommend whipping around the other exhibitions again after you’ve seen the artists working. All of a sudden, the whole place seems much more alive. Weave your hands in the air like you just don’t care. 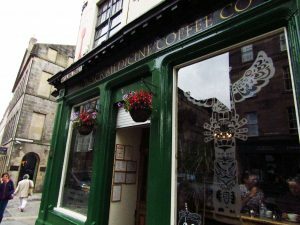 There are literally hundreds of coffee shops in Edinburgh – and that’s not even counting the Starbucks, Costas, Café Neros etc etc etc. I’d always rather support a local business that a multi-national that doesn’t pay its taxes but, so even if Black Medicine isn’t your cup of tea (or coffee), websites like http://www.eh1.com/tag/coffee/ have great lists of all the best place to get your morning brew or pick up an afternoon snack. But also, I’m sticking with Black Medicine. Because I’m all about those window seats. It’s not that the Elephant House isn’t a great coffee shop – it is. They’ve got a great selection of teas and coffees and the staff are all very friendly. It’s just not a great coffee shop in August. If you don’t know, the Elephant House is hugely busy because, apart from being in a prime location, it’s also where J K Rowling came up with the idea for Harry Potter. Now any month of the year that will pull in an extra few customers at most, but during August the place is crammed full of people buying bottles of water just so they can take photos. Around lunch time there’s usually a line out the door, and if you do manage to get inside there definitely won’t be enough seats to go around. Honestly, check out the Elephant House, but do it some other time. Black Medicine is still busy, but it’s a little bit out of the way so it’s less so. It’s been voted the best coffee shop in Edinburgh a few times, but it still doesn’t seem to every be totally full, especially if you go in the afternoon and in to the evening. It’s open 8 – 8 every day except Sunday, when it’s open 9 – 7. If you can, grab yourself a window seat and watch the passers by as you do some work or just enjoy your purchase. Otherwise, there is plenty of seating down stairs, and the wifi is VERY fast (a necessity for any good coffee shop nowadays). All the food and drink is great, but don’t miss out on their carrot cake. It’s the best in Edinburgh. 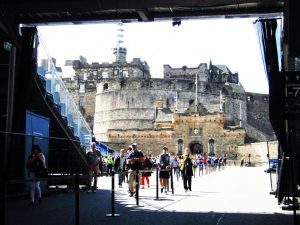 During August, the front courtyard of Edinburgh Castle is taking up by hundreds of meters of scaffolding, providing seating for the Military Tattoo. Which means that the view from the castle walls is a little bit ruined at this time of the year. It also costs a fortune and is absolutely packed. There are hundreds of ways to ruin the magic of a historical monument. Kilometers of scaffolding is definitely one of them. Last I hear it’s free to walk up a hill, so already we’ve got that on the ‘pro’ list. 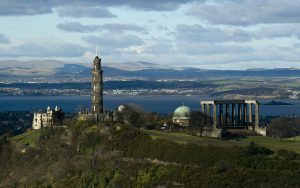 Parts of Edinburgh are an absolute master-class in city planning, and nowhere is that more apparent than atop Calton Hill. A short walk (ten minutes at most) to the summit and you are met with a smattering of historic buildings – seemingly very random, but there are information points across the hill detailing what everything is and why it was built there. I would particularly recommend the Nelson Monument – it’s only a fiver to get in, and if you go at 2:30 on Saturday, there’s a free talk about the Old City Observatory that also stands on top of the hill. Go for a wander, and gaze Northwards to Edinburgh’s New Town and the Firth of Forth bridge in the distance. Rows after rows of Victorian era town houses are a clear remnant of the industrial revolution, and more placards around the summit reveal how the town was planned and grew during the 19th century. Certainly, the Castle is interesting because it records some important moments in Scottish history, but it’s very much a ‘top-down’ approach, focusing on royalty, conquests and the aristocracy. But if you want to get a feel for the city itself – how it came to be, and what it was like to live there, then Calton hill is the place to go. For the last decade, Hive has become unequivocally tied to going out at the Edinburgh Fringe. The music’s loud, the drinks are cheap and it’s open late – to be honest, if you’re in Edinburgh during August, you will probably end up at Hive, whether you want to or not. However, if you are compos-mentis enough to choose where you’re going out, I would suggest that the sticky, urine soaked walls of Hive may not be your best option. Instead, I’d give Paradise Palms a go. Just across the road from Bristo Square, Paradise Palms has a live DJ most nights, and they do a great line in five pound cocktails, and the sharing teapots are great value for money if you’re planning on sticking around for a while with your friends. Entry is always free (Hive charges on Fridays and Saturdays) and the music is very cool, with a live DJ most nights playing tracks that literally (not proto-literally, actually literally) cannot fail to make you dance. So that’s it, our top picks on how to live like a local in Edinburgh this Fringe season – and as promised, some show recommendations. Police Cops in Space – they’ve had a bit of an issue with this show as word on the grape vine is that one of their actors injured themselves recently. But fear not, they’re still up and running – the company is called The Pretend men, and their unique blend of self-awareness and fast pace physical comedy is a must see. Trainspotting – if you haven’t seen this show yet then…you probably don’t go to a lot of Fringe festivals. It’s been running for over six years now, touring around the UK and being absolutely brilliant. Just be careful you don’t sit next to the toilet. From Dust – Lion House Productions deserve a lot of praise for this show, despite it not quite living up to expectations. They continue their enchanting brand of storytelling, this year in a much bigger venue, so while some of the magic is lost to the empty seats, I would say that it is still definitely worth seeing. Let us know if you’ve seen anything that you think is worth mentioning – or for that matter, if there are any great local secrets you think we’ve missed out. And of course, keep an eye out for the weird and wonderful shows on in Edinburgh this August!